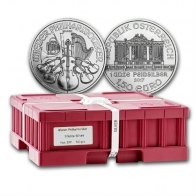 Monster box of Austrian Philharmonic silver bullion coins. Brand new, 2019 silver Austrian Phlharmonics - Brilliant uncirculated condition. Each box contains 25 tubes of 20 coins, in packaging direcly from the Austrian MInt. Total of 500 coins. 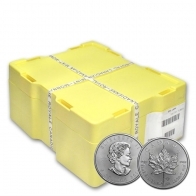 These monster boxes are very popular with silver investors looking to buy larger amounts of silver coins. The Austrian Philharmonic silver coins feature images of the Vienna Philharmonic instruments on them, and each coin has a face value of €1.50. 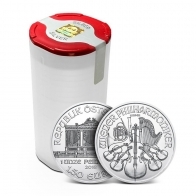 The Austrian Philharmonic coin series is available from the Austrian Mint in gold, silver and platinum. 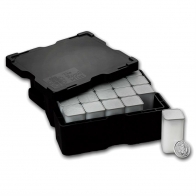 Monster boxes of silver philharmonics are available from SwissBullion.ch for VAT-free Swiss storage or delivery.